Goodnight, sweet prince. You were too good for this world. Cadburys have confirmed they will be scrapping Time Out bars in a move that confirms they've been taken over by evil supervillians, the likes of which have never been seen before in the chocolate industry, and are trying to ruin chocolate. 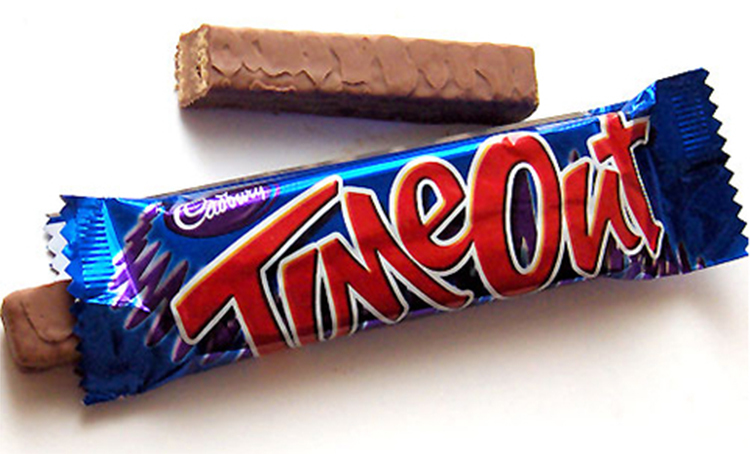 Cadburys have made the decision to scrap the delicious Time Out bars because of poor sales. Just one week after everybody loved them for creating three new MASSIVE chocolate bars, they have reverted to their evil ways. It's the change to the Cadbury's Creme Eggs recipe all over again. Rather than the traditional, delicious Time Out bar, with two sticks inside, the Time Out Wafer is a single stick of mainly wafer with a bit of chocolate on it. The new bar will only be 111kcal, a dead giveaway that it won't be any good. "This bar still tastes chocolatey, sure, and there are worse things to snack on, but it's mostly wafer, and as such it's pretty dry and disappointing. I get that the goal is to provide a nice calorie friendly snack, but they could have launched this alongside the original Time Outs, I'm sure sales would have increased with people just not wanting to buy this one. Okay, this bar isn't awful, but it's not good compared to what once was, and it's going to be a sad reminder that something significantly more chocolatey was once available. Why, Cadbury, why? A spokesperson confirmed that no new original bars were being made as of February. "We have withdrawn the current brand so the old one has gone and will be replaced," they said, probably from a headquarters nested in a volcano somewhere. "The original Time Out bars started to be withdrawn from sale in February".